The early history of the city of Rome is shrouded in myth. Although there is consensus that twin brothers Romulus and Remus played a key part, Plutarch admits that some ancient authorities didn’t even believe that the city was named after Romulus, let alone acknowledge his existence. He opens his biography of Romulus with a short review of different accounts of the origin of the name Rome, before telling the story with the widest credence, about the twin brothers. If there was a Roman counterpart to Theseus, in his role as the developer of Athens, it’s most likely to be Romulus. Although he doesn’t seem to have engendered the same cult following as Theseus, Romulus was revered by the Romans, and well into more modern times. The three Carraccis, Ludovico (cousin), Annibale and Agostino (brothers), told his story in a magnificent series of frescoes which they painted on the walls of the Palazzo Magnani in Bologna, Italy, between 1589 and 1592, two of which I show below. Aeneas, survivor of the fall of Troy, became king of the Latins and went on to found the city of Alba; his descendants ruled in their turn, until it came to the brothers Numitor and Amulius. They divided their inheritance, with Amulius taking the treasure which had been brought by Aeneas from Troy, and Numitor ruling Alba. Amulius then used his wealth to wrest the throne from Numitor; to ensure that Numitor’s daughter couldn’t produce any male heirs, Amulius made her a priestess of Vesta, so she was sworn to remain a virgin. Soon after that, Numitor’s daughter was discovered to be pregnant. Although this traditionally would have led to the death of any Vestal Virgin, Amulius’ daughter interceded, and she was merely kept in solitary confinement. She gave birth to twin boys, who were superhuman in their size and beauty. Amulius ordered one of his servants to take the twins away and drown them in the river, but they were put first into a trough which functioned as a boat. As a result they were washed ashore downstream still alive. A she-wolf then fed the babies, and a woodpecker watched over them; both were later considered to be sacred to the god Mars. 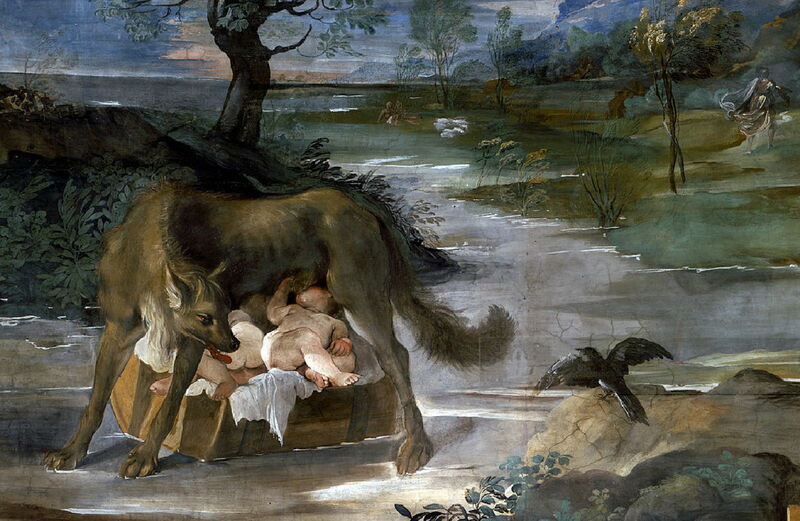 Ludovico Carracci (1555–1619) and/or Annibale Carracci (1560–1609), She-Wolf Suckling Romulus and Remus (1589-92), fresco, dimensions not known, Palazzo Magnani, Bologna, Italy. Wikimedia Commons. One of the frescoes in the Palazzo Magnani, probably painted by Ludovico Carracci and/or Annibale Carracci, shows the She-Wolf Suckling Romulus and Remus (1589-92). The twins are still inside the trough in which they had survived their trip down the river, and on the opposite bank a woodpecker is keeping a close watch. At the far right, a now rather diaphanous figure may be Faustulus, one of Amulius’ swineherds who discovered the twins, and took them to his wife. Peter Paul Rubens shows Romulus and Remus being discovered by Faustulus in his painting of 1615-16. Not only is the she-wolf taking care of the twins, but a family of woodpeckers are bringing worms and grubs to feed them, and there are empty shells and a small crab on the small beach as additional tasty tidbits. Rubens also provides a river god and water nymph as guardians. 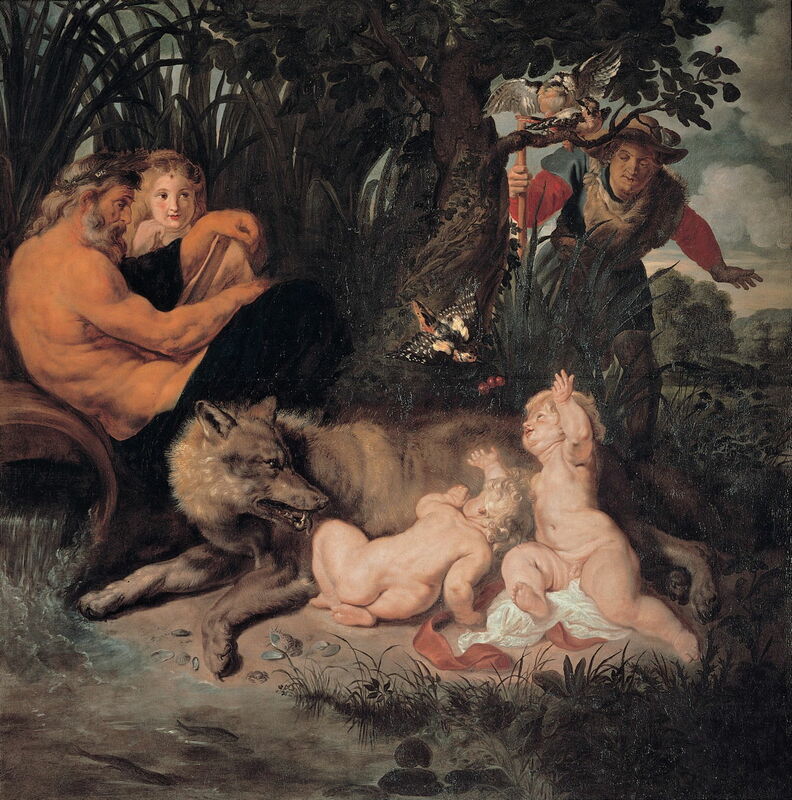 Nicolas Mignard (1606–1668), The Shepherd Faustulus Bringing Romulus and Remus to His Wife (1654), oil on canvas, 148.5 × 145.1 cm, Dallas Museum of Art, Dallas, TX. Wikimedia Commons. 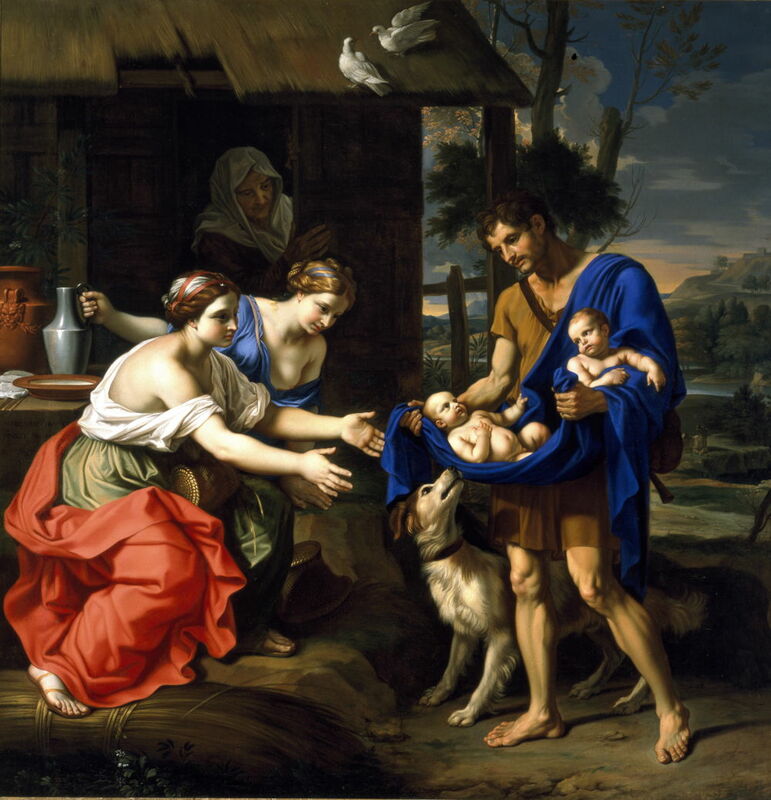 Nicolas Mignard shows The Shepherd Faustulus Bringing Romulus and Remus to His Wife (1654), in which Faustulus has become a keeper of sheep rather than swine, and his extended family appears most welcoming. Romulus and Remus, as they were now named, were brought up without Amulius’ knowledge. Although both remained large and fine specimens of humans, Plutarch tells us that it was Romulus who appeared to have the better judgement, and behaved in a more commanding way. As they grew older, the brothers became renowned for their hard work and good deeds. Their early life was not without further incident, though. When Romulus was busy with a sacrifice, Numitor’s herdsmen captured Remus and handed him over to Numitor. The latter recognised that Remus was special, and Remus in turn was open with Numitor over his mysterious origins. As a result, Numitor decided to talk to his daughter in secret, to try to determine whether the twins might have been hers. Faustulus, their adoptive father, tipped Romulus off, and he went to Numitor with the trough in which the two had been carried downriver when babies. One of Numitor’s guards recognised the trough, and it became more widely suspected that Romulus and Remus were the grandsons of Numitor. Amulius raised a small force to try to deal with the developing crisis, but Remus incited revolt in the city, and Romulus attacked at the same time. Amulius was seized and killed. Numitor was restored to the throne, Alba returned to order, and the twins’ mother was released and paid the respect she had been due. Romulus and Remus then set out to found their own city, which they intended to populate with the slaves and other outcasts from Alba. The brothers couldn’t agree on its site, though, so decided to settle the matter by ‘the flight of birds of omen’: Remus said that he saw six vultures, but Romulus won with a claim of twelve, which was a lie. When Remus discovered his brother’s deceit, Romulus was busy digging a trench for the city’s walls. Remus ridiculed his brother’s work, got in his way, and finally leapt across the trench, which triggered a battle between them, involving their supporters. Remus, their adoptive father Faustulus, and others were killed, and some claim that it was Romulus who killed his own brother. After burying his brother, Romulus started to build the city of Rome. Annibale Carracci (1560–1609), Romulus Traces the Boundaries of Rome (1589-92), fresco, dimensions not known, Palazzo Magnani, Bologna, Italy. Wikimedia Commons. 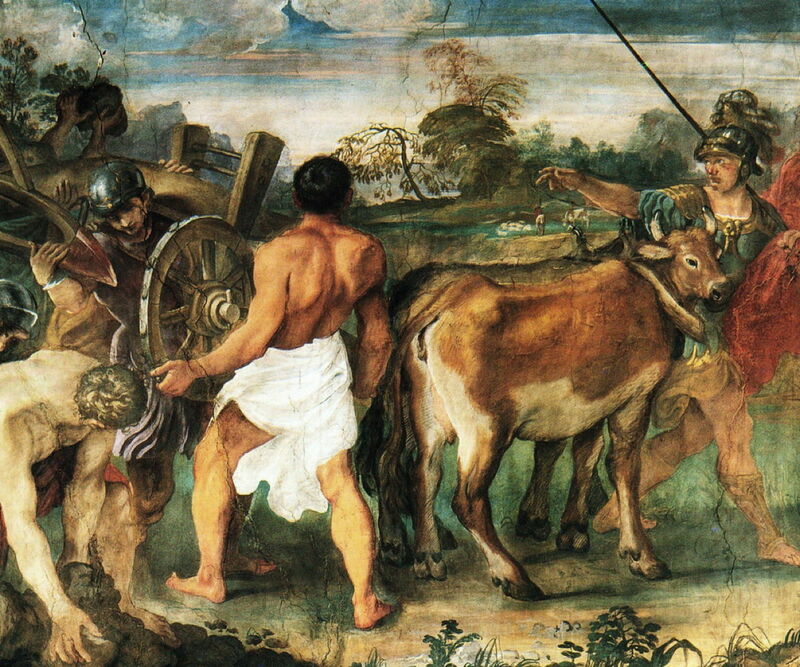 He yoked a plough with a bronze ploughshare to a bull and a cow, and drove a deep furrow around the city’s boundary. This is shown in Annibale Carracci’s fresco in the Palazzo Magnani of Romulus Traces the Boundaries of Rome (1589-92). The bronze ploughshare is at the left, being fixed to a wheeled plough, with Romulus at the right, ready to lead the bull and cow around the boundary. When the city was complete, Romulus took charge and formed legions from its male population, set up a senate consisting of one hundred patrician councillors, and brought order. There was only one problem, though: its inhabitants were almost entirely male. I will conclude this summary of Plutarch’s life of Romulus in the second article, which starts with the shocking solution to that, the abduction of the Sabine women. Whole text in English translation at Penelope. Posted in General, Life, Painting and tagged biography, Carracci, history, Mignard, morality, painting, Plutarch, Rubens. Bookmark the permalink.